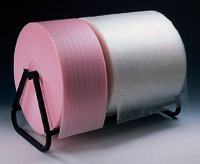 Hold single or multiple rolls. Store and dispense bubble, foam, kraft paper, corrugated wrap, and more. Easy to load and operate. Just pull out needed amount and cut. Durable metal construction.